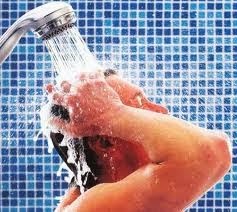 The NewsLine: Do you need to shower everyday? Do you need to shower everyday? What's behind the links between health and less showering? People with skin issues have long noted that forgoing daily showers can help with eczema, and plenty of others think that it is actually healthier overall, for similar reasons that not washing one's hair can make for shinier, less-frizzy hair. The natural body oils that lubricate and protect the skin get washed away by warm (and especially hot) showers paired with soaps that strip the skin. Without those oils, the skin is more vulnerable to bacteria and viruses, and can also look and feel dry and uncomfortable. Because the body wants to keep the skin in healthy, protected shape, frequent washing can even encourage the body to overproduce oil, leading to a viscious cycle of cleansing and oil production. Many people have found that when they stop washing hair and skin as often, after an adjustment period, the body naturally decreases the amount of oil it produces and less washing is needed. Confession: I only shower three times a week, and I wash my hair on one of those occasions — but that's just because it's winter. In the summer, I shower every day, but most of those are just rinses in lukewarm water, sans soap so I don't dry out my skin. The drier, colder air of winter saps my skin of moisture, and since I use only natural products, keep active, and don't eat much processed food (and it's cold), I have almost no body odor. You can also shower briefly, as I do, and lather up only the areas that need it on a daily basis (we all know what those are), protecting most of your good skin oils from being washed off, while still enjoying a couple minutes of shower time. You can also wash with oils, which is a popular and growing treatment for dry skin. I do this too and have noticed that since I started washing with organic coconut oil (yes, oils will clean, check out the site dedicated to oil cleansing for an explanation), I feel refreshed, moisturized and smelling great — I add a couple drops of sweet orange or rosemary oil as I love scent.